IdentityIQ Secure is a great choice if you are looking for basic security and peace of mind without a high price tag.You get $1M insurance, Internet monitoring, SSN trace, 1 bureau credit monitoring and a whole lot more. Discounted Additional Reports & Scores With an IdentityIQ membership you can purchase additional credit reports and scores at a discount, any time you need them. Use this benefit to add a 3-bureau credit report if you plan does not include one, update your scores, or double-check your report before making a big purchase. Dispute Assistance Our expert representatives can assist you in disputing information included in your file. If you find inaccuracies in any of your credit files, call us to start the dispute process with all three bureaus and ensure a timely response. 1 Bureau Daily Credit Monitoring & Alerts Daily monitoring of your credit file at 1 of the major bureaus, combined with prompt email alerts, lets you know about changes to information in your file that could signal fraud. Credit Score Tracker Credit Score Tracker plots your 1 bureau credit score on a graph each month so you can see trends over time. The score is automatically updated and will be ready when you login. Lost Wallet Form & Assistance Our Lost Wallet Form is a convenient document for logging your debit, credit, insurance and other important cards so you can quickly identify them in the event of loss or theft and take immediate action to cancel and replace them before they can be used. It can also aid in filing police reports and follow-up resolution calls if your wallet was stolen. In the event your wallet or purse is lost or stolen, a Fraud Restoration Specialist will personally assist you in obtaining new cards and documents to the extent allowed by state and other laws. Opt-out IQ (Junk Mail/Do Not Call List) These helpful tools enable you to restrict access to your personal information. Keep telemarketers and direct mailers away by using the "Do Not Mail" and "Do Not Call" lists. ID Theft Insurance - $25k $25,000 ID Theft Coverage - provides up to $25,000 in coverage for legal fees, miscellaneous expenses and up to $1500 per week (five week maximum) for wages lost while resolving a stolen identity event. $0 deductible applies. Underwritten by AIG. US-based ID Fraud Restoration Specialist If you are a victim of identity theft, IdentityIQ provides an expert Fraud Restoration Specialist to ensure your financial security, privacy, and your rights under state and federal law. 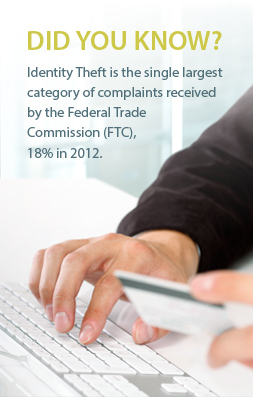 Recovering from identity theft is not easy, but with the help of IdentityIQ, you can feel confident your name is in good hands. IQ CenterLearn more about effectively managing your credit and protecting yourself against identity theft with educational articles. IdentityIQ provides easy access to relevant information when you need it plus a whole library of easy to read and informative articles.